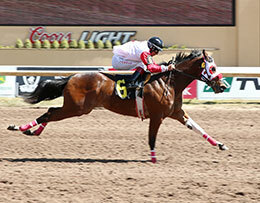 Ivoriona, under jockey Jorge Torres, sets a new 250-yard Remington Park track record by a Paint or Appaloosa on Sunday. OKLAHOMA CITY, OK�MARCH 20, 2016�Record-setting debuts are rare feats, reserved for only the most promising race horses. Ivoriona fits the bill as she obliterated her competition in her first race, rolling to a new 250-yard Remington Park track record by a Paint or Appaloosa. A two-year-old Oklahoma-bred Paint filly, Ivoriona gave a glimpse of her potential when she easily won a Remington Park training race on March 2. Showing she was ready for the real thing, Ivoriona rocketed from the starting gate in Sunday�sopener at Remington Park for Paint and Appaloosa maidens. Jockey Jorge Torres was simply a passenger, hand-riding her throughout as she poured it on to win by 3�-lengths, crossing the finish in :13.036 seconds over a fast track. The time set a new Remington Park standard for Paints or Appaloosas at the distance, besting the old record of :13.169 seconds set in May 2014 by Fly CB Fly.